I'm mildly embarrassed to admit that almost my entire outfit is from Old Navy. I'm totally a walking Old Navy ad. Everything but the jewelry. I also totally did not do that on purpose. And the items were not even purchased at the same time, but they do all work together nicely! Oh well, I'm just going to be a walking ad today! Since I dressed down a couple of days already this week I decided to wear a skirt today. Granted it is a long denim skirt, but I still felt like wearing it! It's not quite as crazy hot today so it's comfortable. I'm so excited for a nice long weekend! Going to kick things off right tonight by having a movie night with my Pants Monkey. We haven't rented a movie in awhile (we long ago said goodbye to Netflix), so we're heading to our local video store (yes these still exist!) tonight to grab something fun and new. Anyone seen anything good lately that you'd recommend that is "rentable" (i.e. not still in the theatre)? As I already mentioned, since we'll be all dressed up to sing at a wedding tomorrow, we're going to go out for a nice dinner afterward. Sunday I think The Pants Monkey is making homemade hot dogs with his dad. And Monday there are sales to be had at the thrift stores, so there is some shopping in my future! I'm looking forward to all of it! I hope you all have a great weekend too! Looking good! I love the navy top and skirt:) Have a lovely weekend! It just happens, you know! I really love that skirt, and can see it being super Fall-worthy. Happy weekend, Beth! I do this too sometimes...I find such great stuff at Old Navy :) Once a week I think I'm wearing everything from there. I like the skirt! All of the video stores in our neighborhood have closed, which is kind of sad because it makes it tougher to get movies that aren't brand new. Very cute outfit. It doesn't matter where the clothes are from. Back in the Seventies, designers put their names on the outside of their clothes, which was tacky but, hey, it was the Seventies! See "The Artist"! Best film of last year. Hey sometimes things from the same store go great together. I often get stuck in trying not to pair things I either bought at the same time or make sure they're not from the same brand, but I realize how limiting that can be! As always those wedges make me swoon, I'll be sad when cold weather comes and they go into hiding. Sometimes things just work out that way! We have definitely worn head to toe Target, Kohl's or New York & Co. Loving your wedges and hope you have a great holiday weekend! Haha! Sometimes I'll find myself wearing pieces all from the same store too..hey, they were designed to look great together, right? Love this outfit on you! 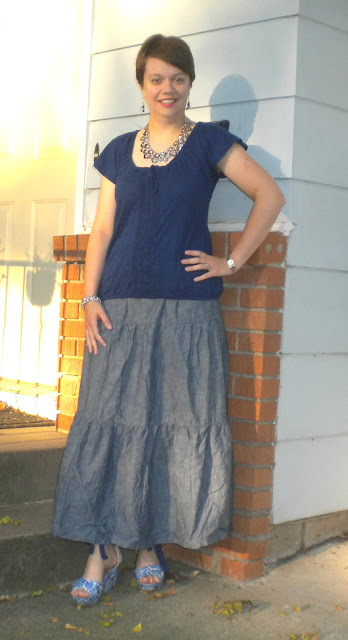 The skirt looks so comfy and breezy- and I love those beautiful wedges. Hope your weekend is going well!